We are a leading Manufacturer of robotic arm trainer kit and 8051 microprocessor trainer kit from Jaipur, India. 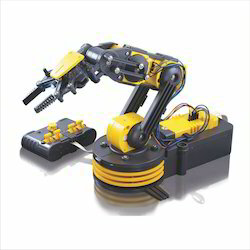 Robotic Arm is versatile training equipment for all robotics enthusiasts to understand the very basic concept of robotics. Robotic arm can be controlled from software or control panel. Control panel has LCD, switches, home sensor LED, connector for external interface with DIP switches and Use Interface. From software user can control each DOF individually through mouse click or key board. Programming a robot was never so easy before our software where user can write instructions in editor window which after compiling can directly downloaded into the processor of robotic arm for defined Automation Task. 8031/8051 Micro Controller Trainer uses 8031/8051 versatile micro-controller. This controller rinds extensive applications in automation. This is because of its architecture and built-in I/O capabilities. The use of this controller considerably reduces the chip count in the final product design. Hence this finds extensive applications In automatic vending machines, weighing machines, welding machines, microwave ovens etc. Therefore it becomes necessary to study the function and Its capabilities, by expetimentation. The Micro-controller trainer is an IBM PC/XT/AT 8 Pentium compatible Instrument. This is a single PCB module. 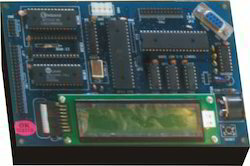 The Instrument Is connected to serial port of IBM computer at RS232C port. A 50 pin FRC connector provides unbuffered Address, Data and Control Lines. This may be used for system expansion at a later date.